One of the things I enjoy doing is developing pictures that someone took long ago, and at some point, lost track of and forgot to develop. Years later, it was found, wound its way into my hands, and was developed. Saving these photos from oblivion is like a moral obligation! In all seriousness, the farther you go back, the more seriously people took an individual photo. When you had to shell out cash for every roll of 8 photos, you didn’t just snap away like we do nowadays. So there’s no telling what might be uncovered. Found Memories…and a Lost Roll of Film – A roll that was already processed, and left inside an old Afga Billy box with a list of negatives its owner wanted to get printed. It includes a couple of pictures of nurses in front of the old Windhoek (Namibia) hospital school, and a whole set of two men working in a woodshop. Check Out My Hat – From a roll found inside an Ansco B2 box camera. Only a couple of photos were salvageable, and one was this awesome shot of two boys proudly posing for this photo. Gone Fishing – From a roll of 127 film with square 4 x 4 photos depicting what appears to have been a family fishing trip that spanned the generations. Nice catch, Grandpa! Day at the Beach – It looks like “Johnny” and “Susie” dressed up in their Sunday Best that day and took a ride in their 1960 Pontiac out to a beach with a long pier and what appear to be seashells. We don’t know how old the car was at the time, but judging from the snappy hat and clashing shirt “Pops” is wearing, I’d say the care was pretty new at the time – which would make these photographs over 50 years old. See anyone you recognize? Cowboy Outfit – The girl in this photo appears to have been on a camping trip and liked dressing up in her cow(girl) outfit. We don’t know where she is from or what camera she was photographed – the only clue for the photographer is the shadow in the photo at right. UPDATED: Turns out, this is from a trip to Yellowstone National Park. Check it out. 110 Pocket Instamatic – Remember those little plastic rolls from the 70s and 80s? This is an odd collection of photos – the family dog, a bunch of gravestones, and a family working outside (digging? it’s all somewhat morbid…). Not the oldest roll of found film, and the first I developed in color. Trip to Vegas – Then there was the retired couple who went to Vegas and stayed at the Mirage, bringing with them their handy Kodak Instamatic X-15. He was a Cardinals fan,, but despite any nagging that may have taken place, never bothered to develop the film from this (obviously not THAT memorable) trip. “Backyard Family” and “My Puppy” – Two completely unrelated rolls of film in the same blog post – one is an old roll of 620 size Kodacolor-X that was damaged in the development process, wherein we can make out a series of posed family back yard shots. The other is a roll of Fotomat brand 110 film that appears to be from the ’70s. It’s all pretty murky, but we can make out photos of a boy and his puppy. I loved that dawg…. Singing Family – This roll supposedly originated in South Carolina, but we have a clue that took me awhile to decode – there’s a college sweatshirt that reads “Kutztown State.” That’s what Kutztown University of Pennsylvania was called between 1960 and 1983. Other than that, I am unable to date or locate the film. Improvising a Lightbox to View Dark Negatives (Found Film) – This roll came out so dark it wouldn’t scan properly. So I made a lightbox out of a Coca-Cola box, and shared how I did it so you can too. Still, the photos themselves held no great revelations. 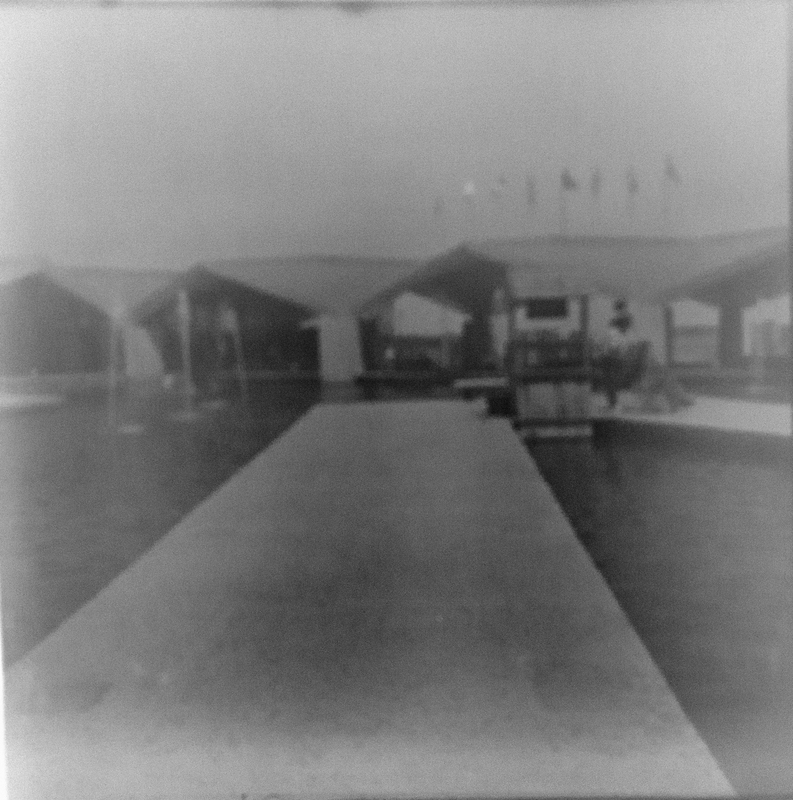 from Fort Wayne, Indiana – a set of badly fogged film from Fort Wayne, from a Kodak Brownie Hawkeye manufactured in the 1950s. You can make out some of the people on the photos. Holy Toledo! It’s an Ansco Anscoflex! – this was an interesting case; only a couple of pictures. Yet, from the clues in the photos, we came this close to possibly identifying who was in the photo. The Toledo Blade could have possibly helped, but I was unable to pique their curiosity. Set of 3: Bill’s Photos – No idea who Bill is – the owner, or the subject of the photos. This is a set of three rolls, all marked with the name “Bill.” The first roll has photos of a happy guy, and photos from a wedding. The second two contain photos of a woman with two children watching as a man opens a gift, and the same man looking out a window. The man is possibly suffering from some sort of physical handicap. Trip to Germany – a whole roll of 35mm film that seems to revolve around a trip to Germany. Military shots, equipment, a bus, and a glider (that’s still in service!) suggest this may have been a US Air Force person touring Germany with colleagues, or former colleagues. Clyde, Texas These ladies appear to have gathered with what looks like a bunch of gifts, in what I’m told is either the Lions Club, or “the old fellowship hall next to the First Baptist Church” in Clyde, Texas. The film was inside a Brownie Starflash, so most likely from the 1960s. The ladies never got to see this picture. But I bet it was a fun day. an Airman in Syracuse Roll of photos from what appears to be a reg’lar, working-class family in America during the 1950s or 1960s. Here’s one of the bunch now – he’s recently enlisted in the Air Force! Doesn’t he look proud? Fungus – Seems to be a roll of photos taken around the yard, and then stored somewhere damp for the next 60 or so years. Regardless how it happened, the film seems to have developed some sort of odd fungal growth – which has created some extremely interesting effects on the photos. Twofer: At the Beach and On the Farm – A damaged roll of 127 film that only had one recognizable shot of a couple on a beach, and a half-used roll of 35mm the seller threw in for free, which had some great shots of a horse farm owner and his family. It Doesn’t Have to Be Old – Shot in the last decade, this roll of 3200 ASA black and white film features shots of San Francisco, a few experimental shots, and – surprise – a selfie by the photographer. For unknown reasons, the photographer had no interest in seeing the results of his work and chose instead to sell them on eBay. There are other rolls in this series forthcoming in later posts. Michelle’s Fisheye Film – With the rolls of film highlighted in the previous post was one roll marked “dev for Michelle.” Unfortunately, it seems Michelle never got her film But if she checks out this post, she can see the results of her work with an interesting fisheye lens that made all the images “round.” I was able to identify the exact spot in Venice, CA some of the shots were taken. New Baby AND a New TV! – From a set of three rolls in a box marked “1964”, these show what appears to be the new family television, and baby boy with his older brother. Dress-Up Dog – From a roll that turned up in Alliance, Ohio, a strange dress-up dog photo and some other assorted family member shots. Seasons – This week I shared two rolls – one showing winter scenes from North Vernon, Indiana, and another roll (which didn’t age that well) showing what appears to be summer “fishin’ hole” pictures from Alliance, Ohio. Everybody’s Gone Surfing – A set of panoramic (double-wide) 35mm slides that I cross-processed. I initially thought the roll was unused, but luckily managed to save these photos, which all ended up doing interesting things, color-wise, due to the cross-process (processing slide film as normal color negative film). Laguna Beach Photowalk – A set of relatively recently shot photos, all from Laguna Beach, California. Includes a “selfie” of the photographer. The photos were taken on a “half-frame” camera, meaning it was ordinary 35mm film, but all the photos were half size, meaning 72 pictures were taken on a “36 exposure” roll. Hannah and her Sister – One of four rolls found in a storage unit in Worcester, Massachusetts (the surfing post, two weeks ago, was another). They were all different film types, and this one was a roll of 110 which I believe probably came from a camera belonging to the person you see to your right. I think this is Hannah, around 9 years old, in the early- to mid-1990s. Hannah’s Tenth Birthday – Same batch as above, different roll. We learn Hannah’s name and her age from the photo at right. All the rest of the roll appears to be from the party. Hopefully someone else took pictures too – because this will be a blank page in Hannah’s family photo album! Year Round – The last of four rolls from a batch of film found in a storage unit in Massachusetts. This is a roll of Advantix film which seems to have belonged to someone who would take 2 or 3 pictures at an event or occasion, and then the camera would set somewhere for a month or two until the cycle repeated again. This is mostly all different people and different times of year. Two Dim Rolls – These are two color rolls I went ahead and developed in color, rather than in black and white as is usually prudent with older found film. The first was found in a Kodak Starflash from Kentucky; the second in a Kodak Tourist that sat undiscovered on someone’s shelf for 25 years. Yellowstone Series (13 rolls, 4 posts) – Batch of 13 rolls of Ektachrome slide film requiring processes that became obsolete in the 1970s. Most were from a trip to Yellowstone and surrounding areas, but there are some odd surprises. Korea, 1946 – Pretty amazing collection of photos that came to me in a box, fully developed. They appear to have been taken by an Army Lieutenant in Korea, just after World War II. The film came to me fully developed; I only had to scan and restore the images. The collection includes shots of Incheon, close-ups of the officer and his colleagues, and follows them back home again to the United States. Definitely worth a look! New Year’s Road Trip 1994 – Color 35mm of what looks like a college bus/road trip on New Year’s, 1994. May have been a party trip to see the Kansas City Chiefs in the playoffs that year. 1949 Chevy – Roll of 616 film found inside a Kodak Six-16 Brownie Junior, likely manufactured in the late 1930s. The film features photos of a little girl and a 1949 Chevrolet with Pennsylvania tags. Bonner Springs – A roll of film that we think came from inside a camera that was sitting on the shelf of a Goodwill store in Bonner Springs, Kansas. May be people looking at the camera snapped photos and put it back on the shelf? Santa Fe Porsche Show – Snapped at a Porsche owners’ get-together in Santa Fe, this roll of film was identified by the person who sold it to me on eBay, along with a bunch of other rolls he had found, as inadvertently having been from his own camera. Brownie Hawkeye – These appear to be photos taken of the grave of Mildred Rita Collins, who passed away in 1970. The film roll was forgotten in an old Brownie Hawkeye. Who was the mystery photographer? Meet the “Smith” Family – Four-part series of film rolls all taken by the same family, and never developed. The film came to me from Colorado. Kodacolor-X film that was developed in black and white, and needed a lot of work to darken and enhance so we could see what these folks were up to way back when. 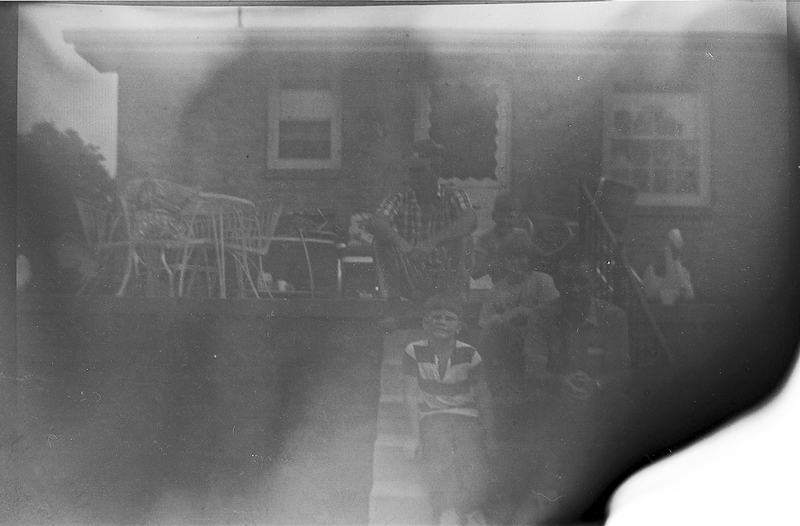 Portraits with Grandma – Roll of film found inside a Kodak Brownie Target Six-20, manufactured around 1950. The photos could have been taken later – a teenaged girl and likely her grandma(s). 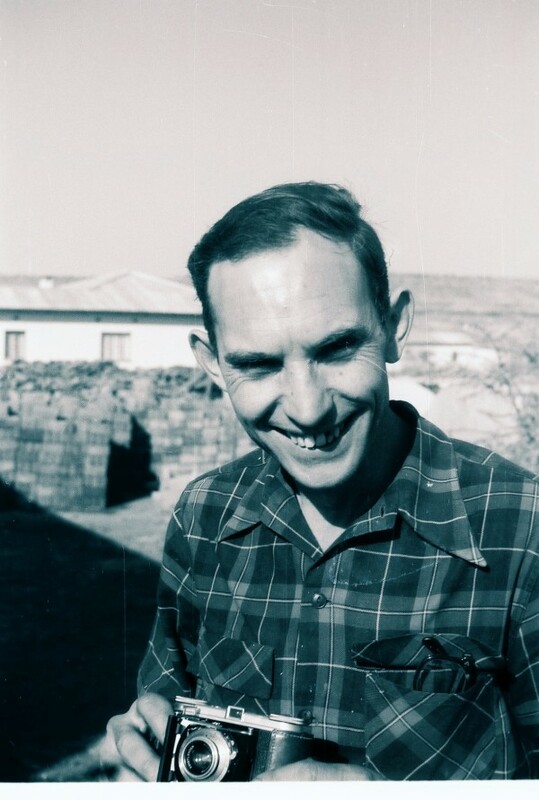 Country Outing – A roll of film that was shot and then placed back into its box – which has a June 1958 expiration date printed on it – and was then forgotten forever. Various images of a swimming hole and different family members posed in front of a country home and old cars. Cowboys and RVs – A roll of Kodak Verichrome Pan, likely taken as recently as the early 1980s, somewhere “out West”, where cowboys can still occasionally be seen riding into the sunset. Only Briefly Misplaced – This roll, it turns out, was only “lost” for a few months. 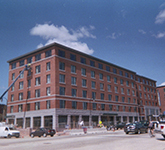 It appears to be successive photos of a Marriott Courtyard in Maine, during construction. I assembled them all into a sort of timelapse. Raymond Albert’s Photos – A set of 20 rolls of (already developed) negatives from Rumford, Maine. Because one roll had a name and address scrawled on it, I was able to deduce quite a bit about the family using that and the content of the photos. This follows the life of a little girl from about 1948 until the mid/late 1950s. Some excellent photos in the collection, worth a look. The Happiest Place on Earth – A roll of 127 film from the 1960s that features a young woman with a 1961 Cadillac, and a set of grainy photos from a long-past trip to Disneyland, which hopefully resulted in lasting memories, since they never got their photos. Portland, Maine – A roll of color 35mm film that someone shot of the buildings and structures in Portland, Maine. The film all had a blue tinge and didn’t seem to be in very good shape, but turned out to be no more than 5 years old. Photos that tell your Fortune! – Not too long ago, you could buy a single-use camera from Urban Outfitters which, when developed, would include a random “fortune” imprinted on each photo. Of course, it was an odd find at the time, given I had no idea about the background. My Very First Camera! – This roll was in a Kodak Instamatic X-15, which happens to be the same kind as my very first camera. It appears to hail from Merrimack, New Hampshire. The roll came to me half used, and I finished the roll 2 or 3 decades after it was started, and on the other side of the globe. 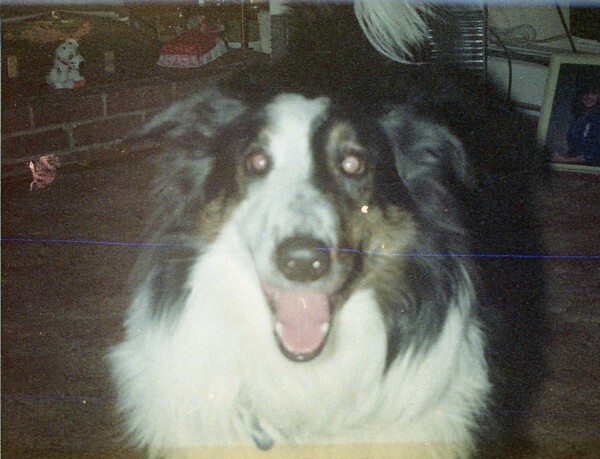 Kodak Hawkeye Instamatic II – A roll of film that showed up inside a plastic Kodak Instamatic II, and contained just four usable images, two being of someone’s long-lost, funny-looking dog. Safari! – A roll from the 70s that appears to be from a trip to a safari park, swimming, and some sort of equestrian event. In a 100-year-old camera – A roll of 122 film found inside a No. 3A Folding Pocket Kodak Model B-4 I got for Christmas had 4 images that could be pulled off of it! Horse Sense – Inside a plastic, 1995-ish-era vintage camera was a roll of film with half a dozen photos on it. No idea who they are, but they sure like horses!